Edison Communication students (l-r) Maranda Dunlap, Emily Hunt, Tess McClure and Kayla Seman will talk about the problem of illiteracy in America and what can be done. GREENVILLE – According to a 2015 United States Department of Education report, 32 million adults cannot read above the fifth grade level… and one child in four currently grows up not knowing how to read. It’s not getting better. Today’s generation is less educated than the one before. 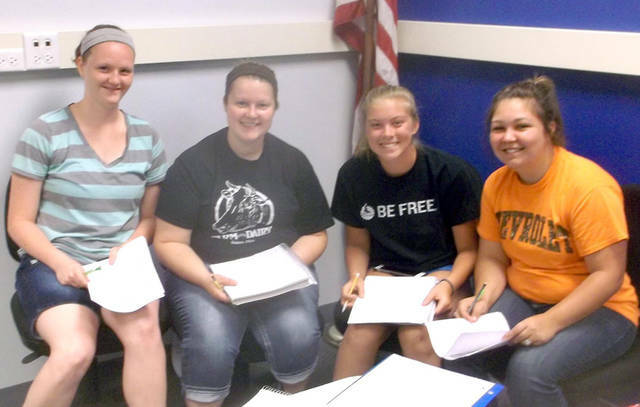 Edison State Darke County Campus Fundamentals of Communication students have focused on literacy as their term project and one team – Maranda Dunlap, Emily Hunt, Tess McClure and Kayla Seman – will make a presentation to the public about this Cornerstone to Success at the Greenville Public Library at 6 p.m. July 26. What is literacy? Is it just reading or does it involve more, such as being able to use the knowledge as a function of success? What is the relationship between literacy and poverty? Literacy and crime? Making healthy choices? What role does it play in the overall well-being of a community? Edison students will explore this critical topic and what it means to a community and the individuals who live in it. They will offer suggestions that could help make a difference, including programs currently available to help young people struggling with their reading and comprehension skills. The presentation is open to all ages and light refreshments will be served. Students will be available to answer questions following the presentation.